Moon says France, UN can speed up Pyongyang’s march to denuclearization by easing sanctions. South Korean President Moon Jae-in on Monday stressed the need to ease international sanctions against North Korea when and if the communist state takes practical steps to denuclearize. The call came in a bilateral summit with French President Emmanuel Macron where the South Korean leader asked France, a permanent member of the UN Security Council, to spearhead the move when conditions are met. In a joint press conference following their summit, Macron emphasized the need to maintain international sanctions on the North to completely, verifiably and irreversibly denuclearize the communist state. He, however, said his country will support ways to further accelerate the denuclearization process if the North is in fact moving in that direction. Moon’s remarks come amid an apparent tug of war between the United States and North Korea over when the North should be entitled to rewards for giving up its nuclear ambitions. In his third bilateral summit with Moon, held in Pyongyang last month, North Korean leader Kim Jong-un offered to take additional denuclearization steps, including the dismantlement of the country’s only nuclear test site, in the presence of international experts for verification. “Chairman Kim Jong-un has said he is willing to not only halt the country’s nuclear and missile tests and also dismantle its production facilities, but also dismantle all nuclear weapons and nuclear materials it currently possesses if the United States takes corresponding measures,” the South Korean president told Macron in their meeting, according to Moon’s chief press secretary, Yoon Young-chan. 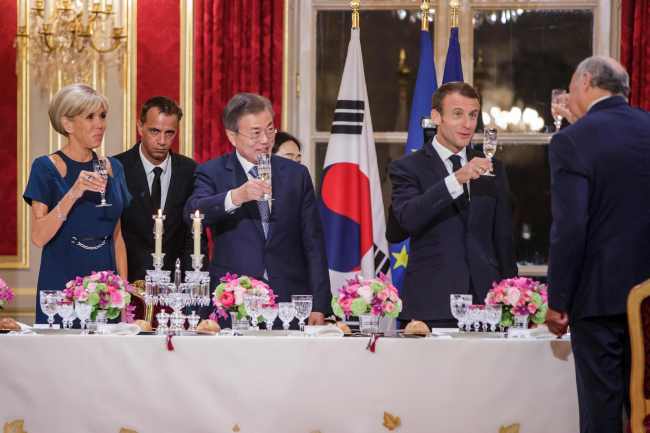 “We must further encourage North Korea’s denuclearization process by easing UN sanctions when and if we decide the North’s denuclearization process has at least reached a point of no return, and I ask President Macron to play such a role as (the head of state of) a permanent member of the UN Security Council,” Moon was quoted as saying. “We are ready to fulfill every mission given to us as a permanent member of the UN Security Council to realize complete, verifiable and irreversible denuclearization of North Korea,” he said. “France will support the president to this end,” added Macron. The leaders of South Korea and France also discussed ways to improve the countries’ bilateral relationship. “The two leaders agreed to expand the countries’ bilateral trade and investment based on the countries’ comprehensive partnership for the 21st century established in 2004, and to take joint efforts to develop new growth engines in the fourth industrial revolution by expanding their cooperation in areas, including the science technology, new industry, SMEs and startup sectors,” Moon’s presidential office, Cheong Wa Dae, said in a press release. He is currently on a five-nation tour that will later take him to Belgium for the Asia-Europe Meeting summit that will involve the heads of state or government from 50 other countries.